Going to go ahead and start this up now, sorry for the size of this. After playing both Chris and Piers from the first update, I snagged 21000 skill points for use in getting some upgrades. I could have sworn you get 3 skill templates to start with, but for some reason I only have one. Maybe that was a hidden change? I can't check it because unlike most games you can't uninstall the patches without deleting the entire game data which is 4GB. But I digress, here we are. All percentages I use are taken from the official guide I have. I include those so you can all think about the future too, since from start to finish my skills are in your hands! Firearm increases the damage of all our gun-related attacks. Arguably the most well-rounded skill in the game that is always helpful. Melee increases the damage of all our physical attacks, which is extremely useful for one character we haven't seen yet. This includes all melee weapons like the knife. Defense is one of the best skills in the whole game. It's my mainstay skill when playing on Veteran and Professional and really evens the playing field and allows for true Rambo play. Level 1: Enemies deal 20% less damage. Level 2: Enemies deal 30% less damage. Lock-on is a skill that I don't have much use for in all honesty. It lowers the shakiness of your aim and allows you to crack heads with sniper rifles easily, but you can just lay on the ground to get the same effect. Rock Steady is a skill like Lock-on, but in this case it reduces recoil and allows you to keep hitting what you're shooting at. Might be useful for automatics but when I aim at something, I don't fire outside of controlled bursts because they are already powerful weapons that drop enemies in record time. Critical Hit is a skill I've always wanted to try but the way I normally play I never need it. 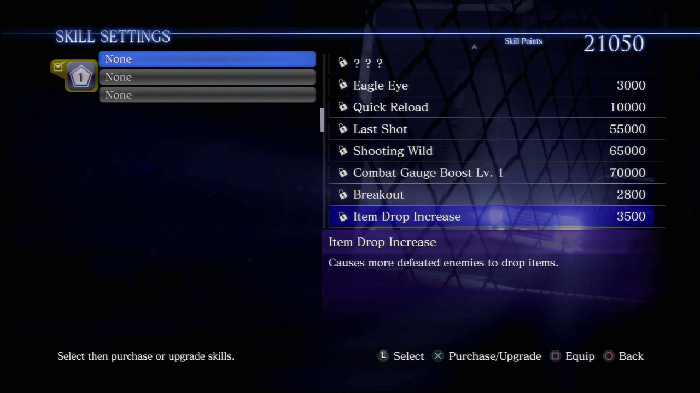 Critical Hits in RE5 and RE6 are when you see the enemy's head explode for whatever reason, headshot or melee. Piercing is a pretty worthless skill that only gives your bullets added piercing potential to other enemies, much like the Punisher handgun in RE4. I've never encountered a moment where I needed something like that, and you can just as easily shoot an enemy in the head and then run up and perform the throwing melee that does huge damage to the crowd behind him. 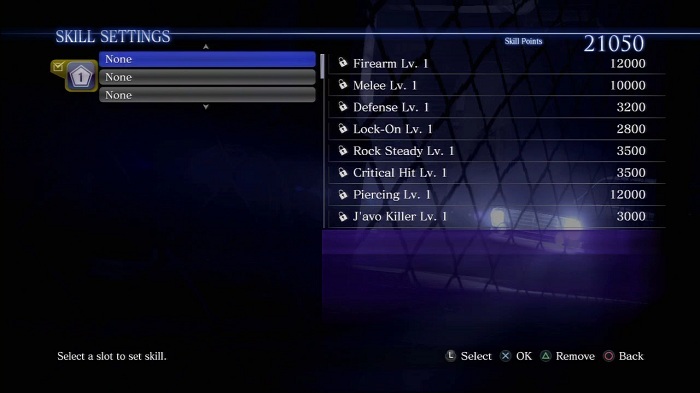 J'avo Killer is a pretty cheap alternative to Firearm and basically increases all of your types of attack damage against the J'avo type enemies. Level 2: Deal 50% more damage to J'avo. ??? (Zombie Killer) We don't need this one yet but it is the exact same as J'avo killer, just for zombies. Eagle Eye is an unnecessary skill that I feel only exists for a trophy in this game. All it does is add one extra level of magnification to your sniper rifles. Quick Reload is another fairly useless skill that only increases your reload speed by 20%, which I can guarantee is only a second or two faster and isn't worth it. Last Shot will greatly increase the damage of the last bullet or shot in your clip. Seeing as how I am pretty OCD about reloading, this will never come in handy for me. However, the guide claims that it deals a whomping 300% extra damage! Shooting Wild will remove our targeting sight but increase our damage by 50%. Combat Gauge Boost is a really cool skill that will increase how much stamina we have. For some characters this is a godsend, and it really allows for plenty of quick shots (Which is GREAT for two characters in particular) and a lot of melee in a short time, so you can go RE5 mode for a while! Level 2: 5 extra stamina bars, for a total of 10! Breakout is the second most useful skill in the game. It allows you break free from any restraints, enemy or otherwise, very quickly, but another use it has is making all the "meter" QTEs much easier! For example, turning a crank or trying to pull yourself up is much faster with this on, and I always have it set when one of those moments comes up. Item Drop Increase is self-explanatory, but I've never really noticed much with it on. I never use it but I never hurt for ammo or health, and even when I grinded for ammo to play on No Hope difficulty, I didn't have to use this. Recovery is a skill that lets you get up from dying on your own faster. I don't plan on going down and even if I do the AI will quickly pick me up. After that, the skills become three different things. 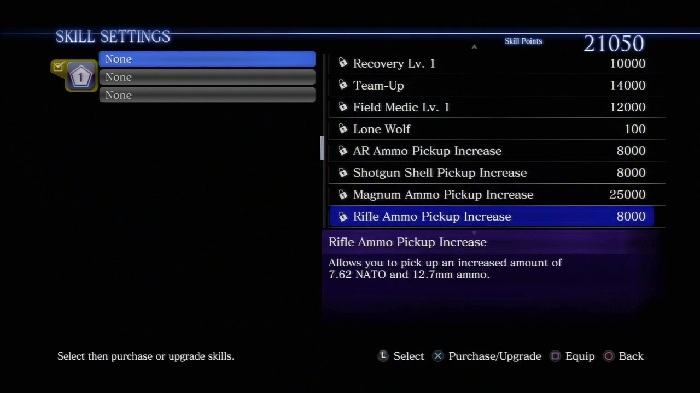 You have weapon type ammo pickup increases which I think just increase the drop rates on certain ammo, then you have the infinite ammo skills (yes, Infinite ammo must be equipped in this game, which I like) and you then have Mastery skills, which just means get a bunch of kills with a certain gun type and you'll unlock a skill equivalent to firearm, but it increases the damage by 100%! Voting's over for this update.